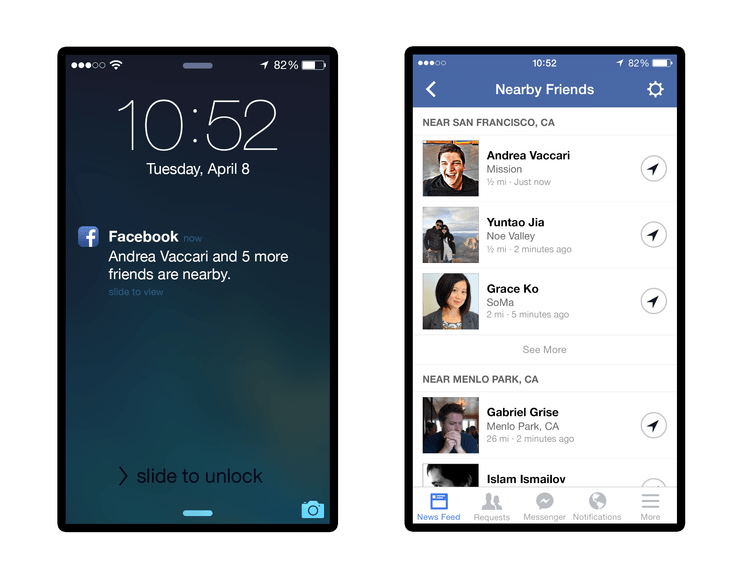 Facebook is introducing a mobile feature called Nearby Friends that taps into that steady stream of location information so friends can track each other in real time. The idea is to make it easy for people to meet up in real life, so they can have conversations in person instead of comment threads, temporarily replacing Likes and LOLs with eye contact and actual laughter. A live meet-up is also an excellent opportunity to grab a selfie with your pal and upload it to the Facebook owned Instagram. The new feature uses the geolocation technology in your smart phone to determine when you are close to one of your Facebook friends. When activated, the feature will send periodic notifications alerting you to friends who are nearby. Users have been able to check in on Facebook for some time, meaning you can already share your location as part of a post, but Nearby Friends allows you to broadcast your general location to Facebook friends without posting at all. The new feature is opt-in, meaning you’ll need to activate it within the app, should you choose to participate. Users who do not activate Nearby Friends won’t be affected in any way, and will not share with or receive any location information from others on the platform.